BEIJING - Outspoken artist and government critic Ai Weiwei talked about giving himself a haircut Thursday but said little else in his first day out of detention, living under a gag order that underscores concerns about China's growing use of extralegal methods to muzzle dissent. The Chinese Foreign Ministry said Ai was released from nearly three months of detention late Wednesday after confessing to tax evasion and pledging to repay the money owed. His family denies the allegations and activists have denounced them as a false premise for detaining an artist who spoke out against the authoritarian government and its repression of civil liberties. The Foreign Ministry said the conditions of Ai's parole require him to report to police when asked and bar him from leaving Beijing without permission for one year. A ministry spokesman did not mention the gag order, but ever since his unexpected release, Ai has told the foreign reporters thronging the gate to his suburban Beijing workshop and home that he is not allowed to talk. On Thursday, he emerged from the doorway with freshly cut hair and wearing a T-shirt emblazoned with his name in giant black letters. "I cut my own hair, looks more spirited," he explained in Chinese. But he said he couldn't give any interviews or say anything about his case. "Of course, it's great to be home," he said. In a sign of Ai's continued appeal among some Chinese, several supporters showed up outside his compound Thursday, despite a police presence. 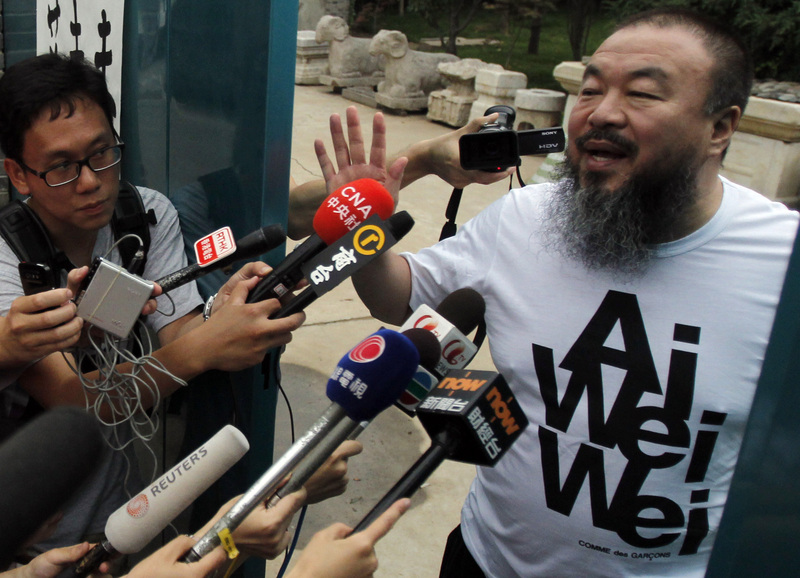 Two Chinese men pasted posters, one in English and other in Chinese, that read "I love you Ai Weiwei" to the door of his compound. In a phone conversation, Ai's wife Lu Qing, said Ai had been forbidden to discuss conditions of his detention and release and was being followed by plainclothes officers whenever he left the house. "It may take a few days to get back to reality," said Lu, who with Ai's mother had been called to pick him up from a police station on Wednesday afternoon. Internationally renowned for mocking, satirical art, the 54-year-old Ai became the highest profile casualty in a spring crackdown to stop Chinese from imitating the democratic uprisings in the Middle East and North Africa. Dozens of rights activists, lawyers and others have been detained, put under house arrest or disappeared, and several of those who have been released have kept almost totally silent ever since. Like some others detained, formal charges against Ai have never been announced. Chinese Foreign Ministry spokesman Hong Lei told reporters at a regular press briefing that Chinese investigators alleged Ai "evaded a huge amount of taxes and intentionally destroyed accounting documents." Hong said authorities decided to release Ai because of his "good attitude in confessing his crimes and because of the chronic disease he is suffering from and his repeated expression of his willingness to pay the taxes he has evaded." Human rights groups and Chinese legal experts, however, noted that even if the allegations were true, economic crimes are usually handled by fines. Beijing-based rights activist and lawyer Pu Zhiqiang said Ai's detention was "politically motivated, and so is his release." "The whole incident is only 'legal' in appearance," said Pu, a friend of Ai. Jerome Cohen, a top expert on Chinese law at New York University, wrote in an editorial posted to the website of NYU's U.S. Asia Law Institute that Ai's release "has little to do with the rule of law, but everything to do with the untrammeled exercise of discretion enjoyed by Chinese authorities." Cohen told The Associated Press authorities could reopen the case at any time, meaning Ai faces the ever-present threat of being detained again on the same accusations. Ai's detention put a famous face on the crackdown the authoritarian Chinese government has vigorously pursued with little regard for China's laws. The U.S. had urged the release of the former New York resident, as did other Western governments. German Chancellor Angela Merkel welcomed Ai's release, but said it "can only be a first step" to clearing the charges in a legal way, her spokesman said late Wednesday. Amnesty International called on China to account for four of Ai's colleagues who have also gone missing. A driver, Zhang Jinsong, was expected to be released Thursday, said a studio employee who spoke on condition of anonymity because they feared official retribution. There was no word on the fate of the other three: studio assistant Wen Tao, accountant Hu Mingfen and designer Liu Zhenggang. Why authorities chose to release Ai now remains unclear. Chinese Premier Wen Jiabao will soon travel to Hungary, Britain and Germany, and was likely to have heard loud calls for Ai's release, but the government has generally resisted such appeals. Ai has also benefited from residual affection in the party for his father, one of China's most beloved modern poets. On Thursday, China's government released another prisoner: Xu Zerong, a Hong Kong-based political scientist sentenced in late 2001 to 10 years in jail for leaking state secrets and another three years for illegal business operations. Rights groups say the main charge against him was that he had obtained and copied books on the Korean War and provided them to a scholar in South Korea. Ai fearlessly challenged the government before his detention. He blogged and Twittered constantly on subjects including the deaths of students in shoddily built schools that collapsed during the 2008 Sichuan earthquake; children killed or sickened by tainted infant formula; and a deadly high-rise fire in Shanghai that killed 58 and was blamed on negligent workers and corrupt inspectors. He had also kept an informal tally on Twitter of people who disappeared into police custody. Ai's Twitter account has remained dormant since his release. The last posting is from April 3, just before he disappeared.